The EcoSeb DD122EA Dehumidifier is a full-size machine that is full of amazing features. Between the dry and laundry modes, you will achieve things you never thought were possible with a dehumidifier. It also comes complete with an ioniser which is hard to find on even the most expensive units in the market. The EcoSeb DD122EA Dehumidifier is the larger unit in a series designed with maximum power. This unit is capable of extracting 15 pints of moisture in a day. This upgraded machine also features an ioniser and 3D louvres so you can direct the air coming out of the dehumidifier. The flexibility of its dry modes and laundry modes combined with the space-saving design make this an invaluable appliance to have in the house. One of the biggest selling features of the EcoSeb DD122EA Dehumidifier is that it only produces 34 dBA. This is on the lower end of the sound scale when it comes to most dehumidifiers. The lower sound on this unit makes it perfect for using in a bedroom or anywhere else that you might be sensitive to noises. 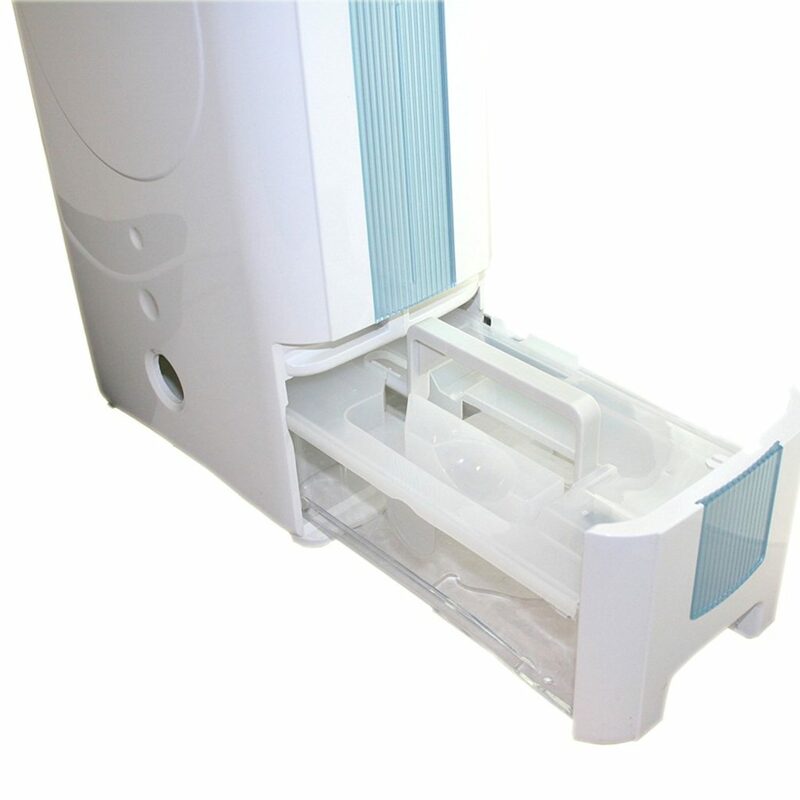 The EcoSeb DD122EA Dehumidifier Classic removes up to 15 pints of moisture per day. Keep in mind that this is the measurement at 68° F and 60% relative humidity. Operating outside of these parameters will affect the overall extraction rate. The tank will hold 4.2 pints at a time (2 litres). You’ll find it located at the side of the dehumidifier. You don’t need to move the unit to empty the tank. Simply slide it out like a drawer and use the convenient carrying handle. There is also a lid over the tank to avoid spillage. Unlike some other dehumidifiers, changing this model to continuously drain isn’t so simple. Instead of just attaching a hose to the threaded outlet, you have to knock out a piece of plastic on the outside of the machine to insert your hose. In addition, the hose that comes with the unit is relatively short at just 3.3 feet. The timer on this unit works for delayed stops instead of starts as most other machines. You can opt for a delayed stop in 2, 4 or 8 hours. 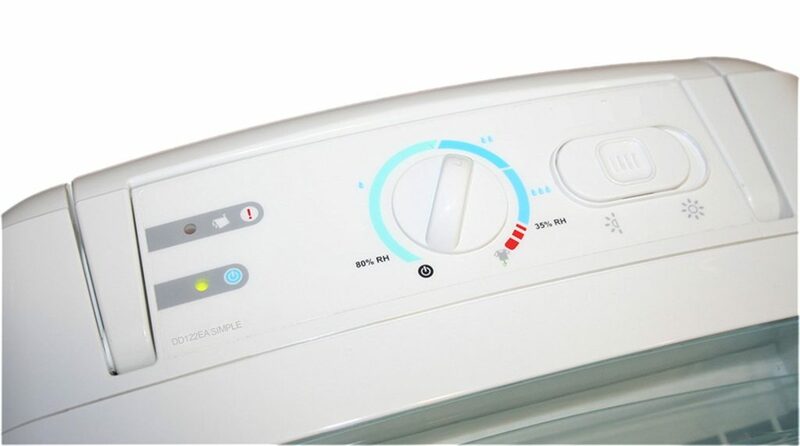 Simply press the red laundry button located on the control panel and you can easily dry your clothing indoors in just two to four hours. There is also an option to speed up the drying with a Turbo function. After the laundry dries, simply remember to set the machine back to either Economy or Auto drying modes. There are several other selling features to the EcoSeb that make it a good value. First, the Ioniser restores negative ions to make your air cleaner and healthier. This isn’t a normal function on most dehumidifiers so it is certainly a perk. The 3D Louvre helps to direct the airflow more effectively where you need it most. You can set it to channel airflow over wide areas or pinpoint the stream to an exact spot. The wide channel is ideal to dry out a room or provide even air distribution. The spot channel is perfect for laundry drying or dealing with areas of mould growth. The DD122EA Classic is set to automatically restart after a power failure. It also features a light to tell you when the tank is ready to empty. The included filter is easy to remove and clean. Simply pull it out every two weeks and gently vacuum it. As you are looking at all the amazing features of the EcoSeb DD122EA-Classic you will inevitably come across the lower cost model, EcoSeb DD122EA-Simple. Here are the main differences between the two units. The first thing you’ll notice is the price difference between the Classic and the Simple models. The Classic retails for around $250 normally and the Simple is priced at about $60 less. If you find that the additional features on the DD122EA-Classic aren’t things you’ll use, then by all means, save yourself a little money. Keep in mind that the lower cost will mean giving up some of the unique features that the Classic has to offer. First, the Simple has no timer. That’s also due in part to the very basic control panel on the unit. While there is a laundry mode on the DD122EA-Simple, it seems limited in capability. The other major difference between the two units is that the Simple doesn’t feature the 3D louvres. While most people might not seem to think this is important, it surely can improve the efficiency of the machine. This is particularly true when you are dealing with an area in a room with excess moisture or you want to dry the laundry quickly. Now that we’ve discussed the difference, let’s check out the similarities these two units have in common. You’ll notice they both have the same extraction rate and water tank sizes. They are relatively the same size with the same sound levels. The compact units are easy to move around and lightweight. In addition, all EcoSeb dehumidifiers feature a 2-year warranty which is a year longer than the standard from most manufacturers. To me, that is usually an indication of a high-quality product. So as you can see, both of the EcoSeb DD122EA dehumidifiers come with useful features and make them worth the cost. They are both an extreme value for the money considering the low noise levels, portability and laundry modes. Either option makes a great addition to the home; it simply depends on which features are important to you. For helpful tips on getting the most out of your unit, be sure to read the How to Use a Dehumidifier Effectively post. The EcoSeb DD122EA-Classic Desiccant Dehumidifier is clearly a winner when looking for an effective way to remove moisture. Featuring the advanced laundry modes, 3D louvres and Ioniser make this a unit that has perks which many higher priced models don’t come with. If you can afford to purchase the Classic model over the Simple model, you’ll find a wide array of options that will be useful in your fight against moisture, mould and mildew.